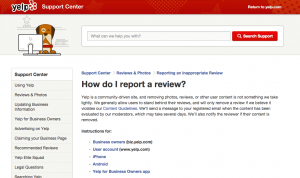 Removing a Yelp Review: Can It Be Done? I have a question about Yelp do they remove reviews or do the people that leave a review to remove them? I’ve had two reviews removed. Yelp doesn’t remove reviews unless there’s a legitimate reason for them to do so. However, they do deem if a review is recommended or not. In looking at your Yelp account, it looks like two reviews were moved to the “not recommended” section. This means that the reviews are still there. However, they are not displayed prominently for others to see. The reason a review is not a yelp recommended review has nothing to do with you, but rather to do with the person leaving the review. The reason a review may be moved to the not recommended section include things such as that the reviewer isn’t an active Yelp reviewer (meaning that they only have a single, or very few reviews), they don’t have a profile image, or the review itself is suspect to be fake. With that said, however, a review can be moved back to a recommended review by Yelp if those users begin to use Yelp regularly, thereby letting Yelp “get to know them” so to speak. There are a number of reasons why a review might not be recommended. For example, the review may have been posted by a less established user, or it may seem like an unhelpful rant or rave. Some of these reviews are fakes (like the ones we see originating from the same computer) and some suggest a bias (like the ones written by a friend of the business owner), but many are real reviews from real customers who we just don’t know much about and therefore can’t recommend. It’s important to remember that Yelp is a community-driven site, and removing photos, reviews, or other user content is not something that they take lightly. If you suspect that a user has removed a review, there’s nothing you can do about it. It is the reviewer’s prerogative to leave and remove reviews. With that said, HOWEVER, if you suspect a review to be false, and you would like to report a review left by a user, there is something you can do! When Yelp began, their intention was to be a source of honest reviews for businesses left by consumers. By offering positive customer experiences and encouraging users to leave an honest review, you shouldn’t have to worry much about your Yelp reputation. However, there are times where this isn’t always the case. If you suspect that a reviewer is being unjust and has left a review that violates Yelp’s Content Guidelines, please, report it. As you can imagine, Yelp addresses tons of requests daily. If you’ve submitted a request, they will get to you, just be patient.